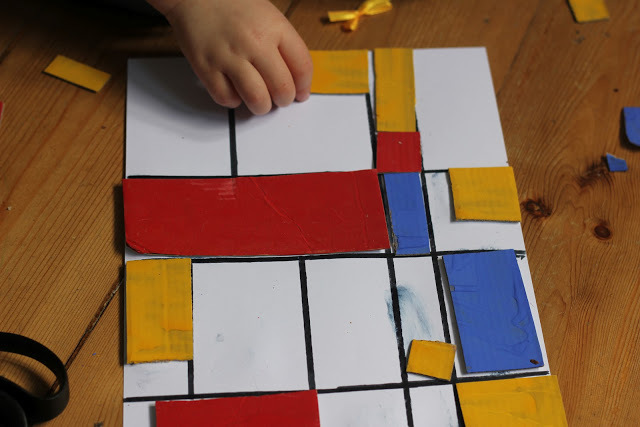 Create a beautiful collage inspired by the colourful work of artist Piet Mondrian! We are thrilled to be joining forces with Red Ted Art, Imagination Soup, Mom to 2 Posh Lil Divas , Creative With Kids and Tinkerlab on a new, bi-monthly art activity celebration. 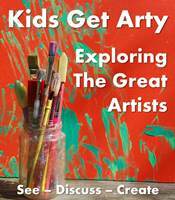 Kids Get Arty will celebrate the work of real artists in all media, and each time we will choose a different artist to be inspired by with our children! I’m particularly excited to begin this new series as before I studied education I did a degree in Art History so I have a special interest in art! I also devised an art curriculum for 4-11 year olds and taught art to primary aged children and I’ve been itching to begin again! Cakie is just about ready to be interested and able enough- wonderful! 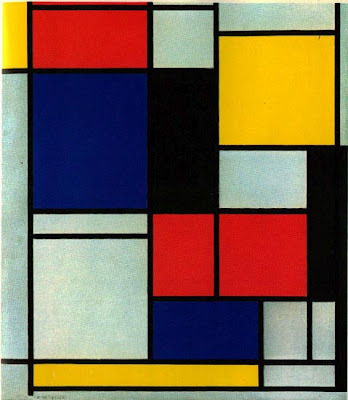 This month we have chosen the artist Piet Mondrian, a Dutch artist from the early 20th Century who is famous for his bold, grid like paintings in primary colours, on a white background. He termed these Neo-Plasticism and they became his “signature art”. 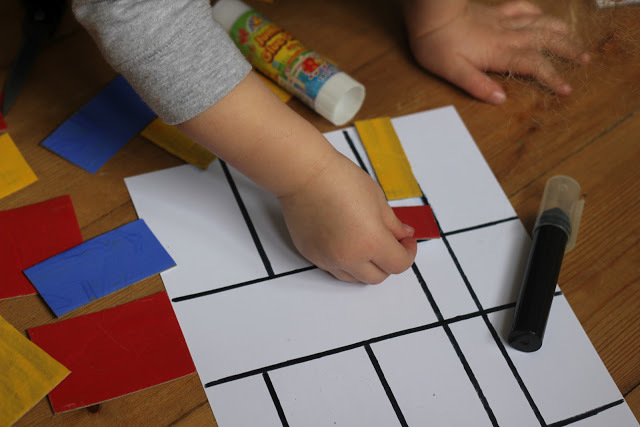 I though these would be a fun launch pad for exploring art with Cakie (now 3 and a half) as they present opportunities to discuss primary colours, shapes and pattern. We looked at a range of his paintings on the internet and in some of my art books before deciding what we would try and make together. 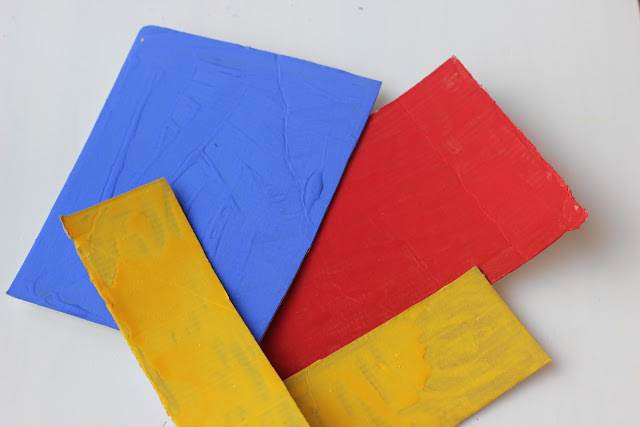 Cakie painted some thin pieces of cardboard using the primary colours red, yellow and blue, and left them to dry overnight. Then I started to cut out some simple rectangular and square shapes for her and she was keen to have a go herself, which she managed surprisingly well. I gave her an A4 piece of white card and talked about the black grid pattern on Mondrian’s work. I drew some lines using a thick black pen and a ruler and again, she was keen to try for herself and have a go. Then she arranged the pieces of painted cardboard over the grid, creating her own pattern and design. She noticed that Mondrian left some of his spaces white and did the same. We talked about the shapes that we used and how rectangles can be stretched long and thin or short and small. We also compared squares and rectangles and talked about the length of the 4 sides on each shape. The finished masterpiece! She has since gone back to it and added some more, smaller shapes and also a yellow ribbon bow that she found, right on top of one of the blue sections! It actually looks quite arty! 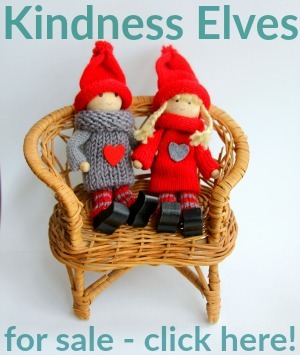 Please take a moment to browse the other wonderful ideas linked up below and also feel free to link up any art work that has been inspired by the work of real artists! 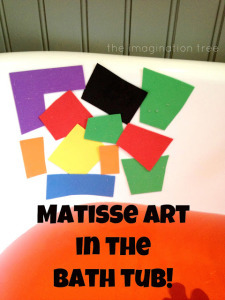 Matisse Art in the Bath Tub! 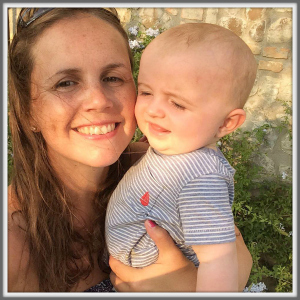 Anna – I just KNEW your post would be brilliant! I love love love this. Fantastic. 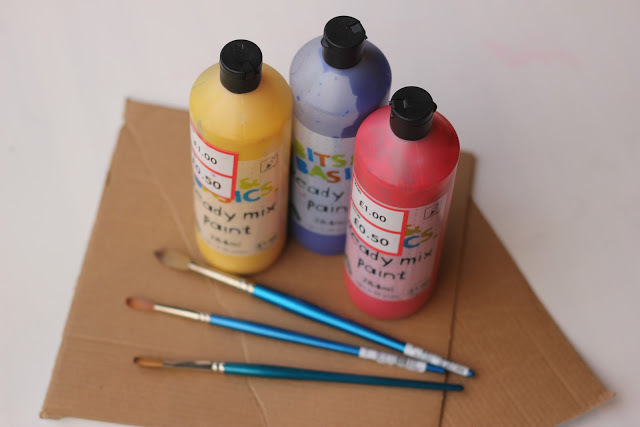 So pleased to have you co-hosting Kids Get Arty! I think this will become a brilliant resource! This is brilliant!! Love the Collage idea. This project is so well thought out, Anna. Totally age appropriate, wonderful talking points, and Cakie really understood the ideas behind Mondrian’s art through the execution. 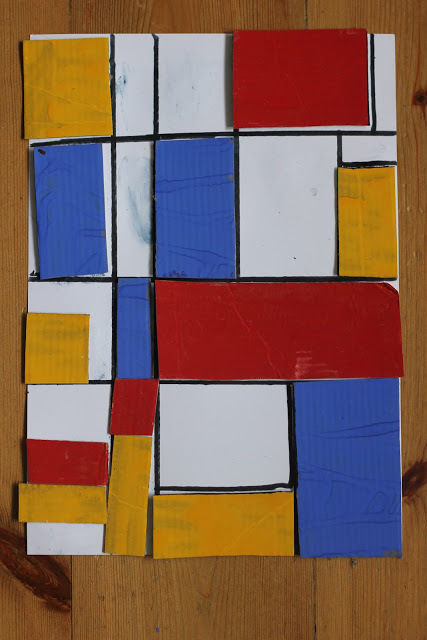 I thought about setting up a Mondrian project as well, and will now take my cue from you! I love this! A great process and the final art piece is beautiful too! Great project! I was a director at a daycare. I had a very creative and talented preschool teacher who did this very same project with the three- and four-year old classes. IT was a HUGE success!!! Her name is Maria Smith. She is studying at Rutgers, NJ to teach art education. My kids and I love Piet Mondrian’s art! Just like how we love yongzheng porcelain art! Contemporary furniture los angeles should have this now. The designs are interesting and at the very artistic. Kid’s will surely love this. A good idea for curtains perth. We wanted to try different home decor with a touch of “creativeness” and this is what I’m looking for.